UMT is pleased to announce that Ms. Jacqueline Howard and Mr. Robert A. Chapman were selected as UMT's 2013 Distance Education and Training Council (DETC) Outstanding Graduate and Famous Alumni respectively. Each year, DETC conducts its Outstanding Graduate and Famous Alumni programs to recognize the achievements of the millions who study at a distance today. Both of Ms. Howard and Mr. Chapman's stories have been published in the 2013 DETC Outstanding Graduate and Famous Alumni book here and are included below. ...an MSM and PMP certification meant less stress and greater career opportunities. A military spouse with a full-time career, a toddler, and another child on the way, sudden moves to California and Alaska convinced Jacqueline Howard to reinvent herself. Excited to discover UMT’s flexibly structured Masters in Management with a Project Management concentration, Jacqueline succeeded in obtaining a Project Management Professional certification. 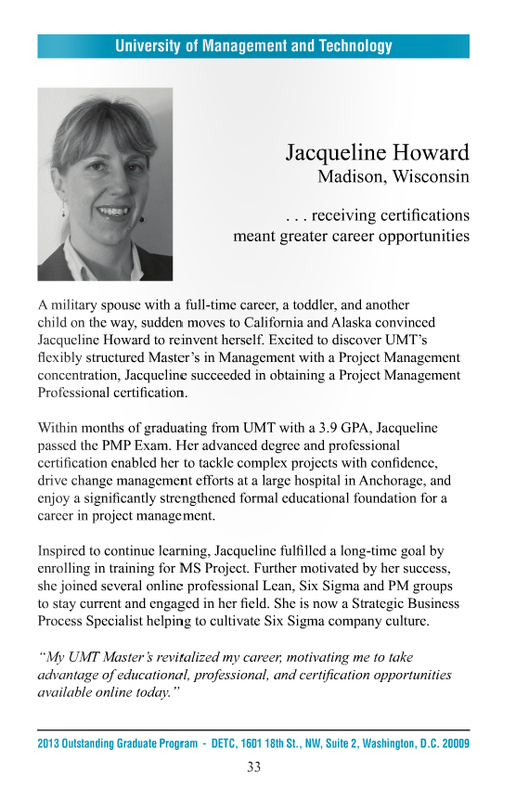 Within months of graduating from UMT with a 3.9 GPA, Jacqueline passed the PMP Exam. Her advanced degree and professional certification enabled her to tackle complex projects with confidence, drive change management efforts at a large hospital in Anchorage, and enjoy a significantly strengthened formal educational foundation for a career in project management. Inspired to continue learning, Jacqueline fulfilled a long-time goal by enrolling in training for MS Project. Further motivated by her success at UMT, she joined several online professional Lean, Six Sigma and PM groups to stay current and engaged in her field. 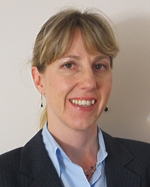 She is now a Strategic Business Process Specialist helping to cultivate Six Sigma company culture. "I was pleasantly surprised at how far distance education has come since my undergraduate days. My UMT Master’s revitalized my career, motivating me to take advantage of educational, professional, and certification opportunities available online today. " …distance education enabled him to overcome a disability to complete his degree. 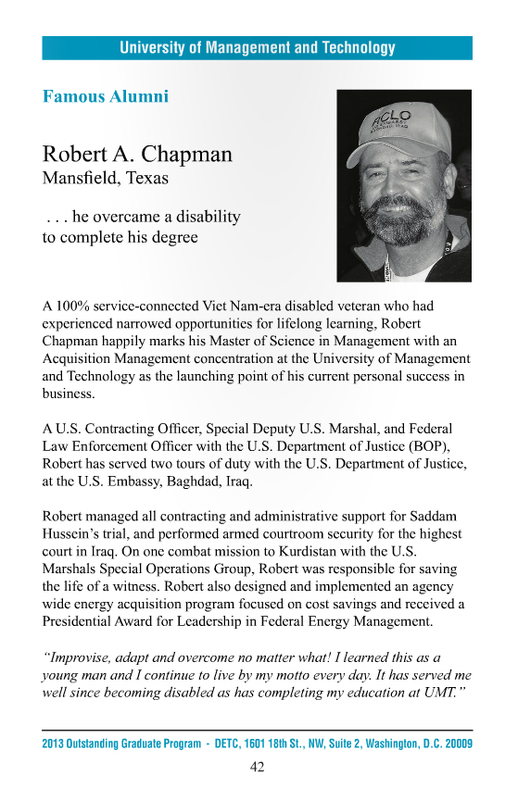 A 100% service-connected Viet Nam-era disabled veteran who had experienced narrowed opportunities for lifelong learning, Robert Chapman happily marks his Master of Science in Management with an Acquisition Management concentration at the University of Management and Technology as the launching point of his current personal success in business. A U.S. Contracting Officer, Special Deputy U.S. Marshal, and Federal Law Enforcement Officer with the U.S. Department of Justice (BOP), Robert has served two tours of duty with the U.S. Department of Justice, at the U.S. Embassy, Baghdad, Iraq. 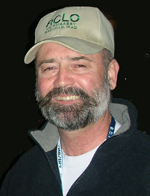 Robert managed all contracting and administrative support for Saddam Hussein’s trial, and performed armed courtroom security for the highest court in Iraq. On one combat mission to Kurdistan with the U.S. Marshals Special Operations Group, Robert was responsible for saving the life of a witness. Robert also designed and implemented an agency wide energy acquisition program focused on cost savings and received a Presidential Award for Leadership in Federal Energy Management. "Improvise, adapt and overcome no matter what! I learned this as a young man and I continue to live by my motto every day. It has served me well since becoming disabled as has completing my education at UMT."